OSLO, Norway – Nov. 20, 2013 – Megapop, a startup studio founded by former Funcom (Age of Conan) and Artplant (Battlestar Galactica Online) developers, today announced a January 2014 launch for Trolls vs. Vikings, their debut mobile / PC tower defense game. The puzzling lane-defense game puts a casual twist on the popular tower defense formula, infusing a blend of humor and an ever-changing battlefield. See it all in action in the game’s official trailer on YouTube. Or download the trailer in 1080p. While set in the ancient world of Norse mythology, Trolls vs. Vikings features a modern rivalry: Loki (yes, that Loki) promises the greedy Vikings a handsome profit for attacking the harmless and misunderstood Trolls. To stop the Viking siege on innocent Troll settlements, players must travel to various Troll villages with an unlikely team of heroes, recruiting dwarves along the way and discovering the truth behind the Viking onslaught. With a tale reaching across the lands of Midgard and into the Halls of the Gods themselves, Trolls vs. Vikings uncovers for once and for all who really started the trolling! Unlike most tower defense games, Trolls vs. Vikings takes a different approach to towers, levels, tactics, player interaction, and boss fights. Players harness immense Troll power to strategically move towers, buff units, and take on other set-piece challenges that add fresh new gameplay to each stage. To keep up with the action, players will be thinking on their feet from start to finish. Just beware of the Valkyries, who have been fed far too much Julekake, threatening to (sugar) crash on top of you! The Craziest Tower Defense Experience, Period – Play as nature-loving Trolls, who must defend Midgard, their magical homeland, from fierce Viking invaders. Extensive Story Mode – Advance across 70 levels spanning the seasons, each one providing new environments, challenges, achievements, tactics, bosses and hilarious new enemies to fight. Plus, each difficulty mode generates different stages! It’s Got It All – Master 20 Troll types, each with their own strengths and weaknesses to battle over 25 different types of Vikings of ranged and close-combat masteries, as well as divine boss fights against Thor, Odin, and Loki himself! 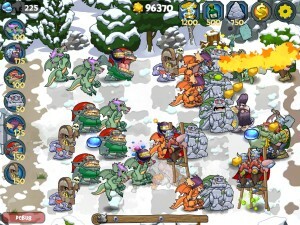 Tower Defense… Evolved – Movable towers i.e. the big hulking Trolls, massive set pieces, strategic resource gathering, dynamic in-game tile system, and many other small and large tweaks to the beloved gameplay formula. Multiplayer Campaign COMING SOON! – Social features will mark a first for the genre with both real-time and turn-based multiplayer matches. Soon, loop in friends with the seamless social sharing and comparing system, or challenge anonymous Troll activists in both live and asynchronous gameplay. Labor of Love – Perhaps the most important “feature” of all… and it’s not even a feature. The Megapop team shares a deep reverence for the tower defense genre; their top priority is to make a game they personally love to play!